Having completed our study of the intriguing dialogues between Vimalakirti and the ten principal disciples of the Buddha, we will now present the conversations between Vimalakirti and other great bodhisattvas such as Maitreya and Manjushri. Their penetrating questions and answers will shed light on how we can cultivate our view of the ultimate truth and how to embrace the Mahayana spirit in our daily practice. Anyone who is following or interested in following the path of the bodhisattva will be inspired by the brilliant conversations between Vimalakirti and Manjushri, as well as those of the other great bodhisattvas! 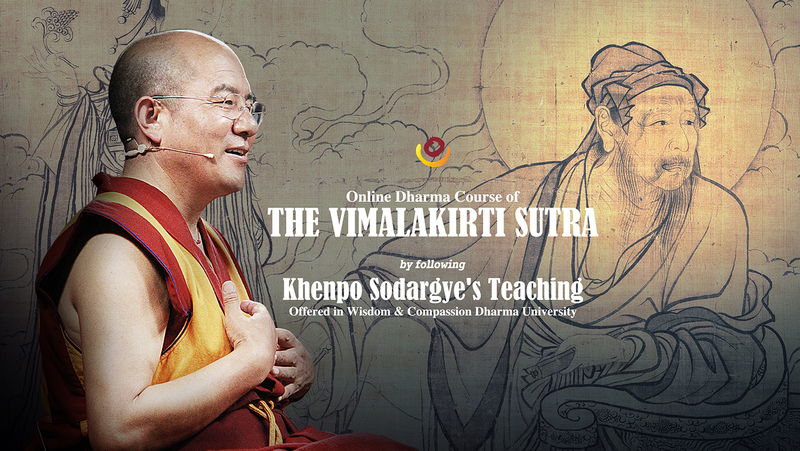 We are pleased to announce that on Sunday, April 14, 2019, the Wisdom & Compassion Dharma University will begin the continuation of its online Dharma course on the Vimalakirti Sutra. This year we will start with Chapter 4, Bodhisattvas, and spend about seven months on the study of the next 5 chapters which cover the conversations between Vimalakirti and Manjushri. The course will be offered in English by Dharma teachers from Larung Gar and will follow Khenpo Sodargye’s oral teaching. Study materials will be provided for each session and each session will be offered twice on each Sunday to better fit your schedule. You can attend either session to follow the course.